High dudgeon, as you might expect, ensued, as people attempted to scandalize this moment on Twitter, using the hashtag #ropegate. It was all very pitiable, sure. But I didn't feel all that bad for the corralled reporters. This was, to my mind, what they deserved and I had a good laugh at their expense. But now I'm here to help out, because that's what I am: the champion of the downtrodden and hero to the dispossessed. 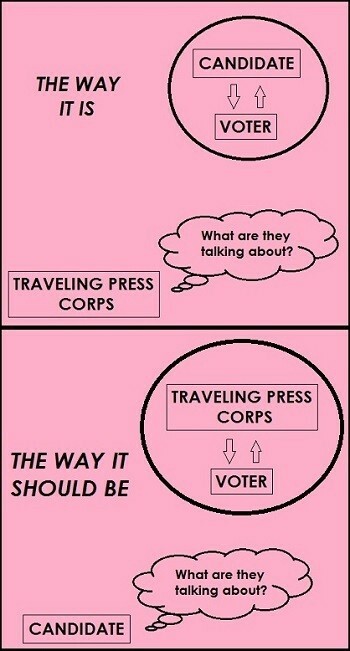 Oh, traveling political press corps, what are we going to do with you? Measured in terms of pure activity, few except those working in active war zones exert more effort, work more tirelessly, or log more hours and miles in pursuit of their quarry. And yet, when it comes time to measure your achievements, your trophy cases are bare and dusty. It's not for want of effort or industry or creativity -- by all appearances, these reporters practice solid tradecraft, are readily adaptable and demonstrate an enviable amount of endurance. I respect that! But do candidates? If this weekend's exploits are any indicator, the answer is no. People who stay in abusive relationships tend to tell themselves lies. The traveling press corps is no different in this regard. The reporters keep telling themselves that a relentless pursuit of presidential candidates from campaign stop to campaign stop is going to earn them key insights. They keep telling themselves their constant presence -- whether it's behind the grandstand or in the scrum -- constitutes a regular dose of pressure and scrutiny from dedicated overseers. They don't understand they are the ones who are actually being led by the nose. But that's about to change, because I'm going to explain how to make all of this better, both for the traveling campaign media and -- more importantly -- for America. Right now, it's clear that the traveling press corps' conception of what constitutes "successful campaign reporting" involves a two-step process that begins with "achieving the closest possible geographic position to the candidates" and ends with "hoping that something happens." Maybe the candidate will incorporate a new sound bite into the mix. Maybe the reporter will get close enough to ask a question. Maybe a flock of crows will attack the crowd. The good news is that if any of these things happen, the reporter will be there. The bad news is that if none of these things happen ... well, the reporter will be there, too. 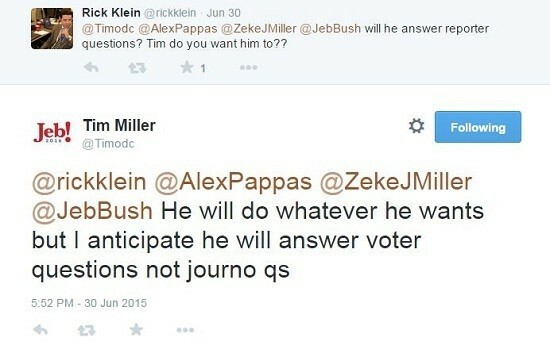 To typical campaign reporters, candidates are the alpha source of "information." Without "information," there is no story. And so their focus is on the stage, at the candidates' performances. But if the candidates have it their way, they are going to roll into the venue, adapt their rigorously rehearsed stump appearance to the proceedings, and leave unscathed. Everything will be very tightly scripted, and the candidates will be aided by a small army of professionals who work diligently to keep surprises and deviations -- those things the gathered press is hoping for -- from occurring. This method of campaign reporting places the participating journalists at a double disadvantage. First, it takes many of the qualities reporters spend years of their lives perfecting -- knowledge, judgment, creativity -- and subordinates them to the grim game of access and proximity. Second, this by extension makes them overdependent on the candidates themselves. After all, they're the ones who exert near total control over access and proximity! When a candidate understands they've got the press corps over a barrel, no one should be surprised that they act accordingly. There is another way. It begins by rethinking this whole notion of geographic proximity. Right now, campaign reporters see the campaign stop as the place the story begins and where the information starts flowing. Instead, they need to view the campaign stop as the place the story ends. They need to start realizing that if they don't have a story by the time the candidate rolls into town, they're late to the story. So, where is the story? Think about it. You know what the candidates need: to persuade voters. And you know where they have to go to get what they need: a short list of states that factor heavily in the primary season, and a short list of swing states that matter in the general election. And because of the modern, tightly scripted campaigns, you have a good idea where and when the candidates intend to travel to get what they need. All you have to do is get there first. Congratulations! You're about to "change" the "game." Candidates want to find themselves in proximity to voters, the better to tell them the story they want told. They'd prefer that reporters just serve as facilitators of that process: document their big sound bites, note the size and enthusiasm of the crowd, and help perpetuate the idea that their campaign is succeeding. The way they conceive your role, you're at a distance from where the action really is, observing the interplay between their campaign and their would-be constituents. Regardless of whether they use a literal rope, you're roped off -- caught in a dependent relationship where you need the access and information that the candidates dole out to you, sparingly and according to preference. What the reporters in this situation need to do is reverse the polarity of this relationship, placing the onus of dependence squarely on the candidates. To do this, you have to exploit the fact that they need to craft a relationship with voters, and you need to enter into an intimate relationship with the voters before they have a chance. There's a term for this that I would not ordinarily use willingly, but I'm going to use it now because I'm worried that many of the people who actually own and run your organizations won't understand this tactic -- let alone get enthusiastic about it -- if I don't invoke this dreaded word. Here goes: You need to disrupt the conversation between candidates and voters. Voters were intensely interested in the environment … So our reporters went out to senatorial candidates and said, “here are the voters’ questions.” Terry Sanford, the incumbent senator, called me up from Washington and said, “Rich, I have these questions from your reporter and I’m not going to answer them because we are not going to talk about the environment until after the general election.” This was the primary. I said, “Well, the voters want to know about the environment now, Terry.” He said, “Well, that’s not the way I have my campaign structured.” I said, “Fine, I will run the questions and leave a space under it for you to answer. If you choose not to, we will just say ‘would not respond’ or we will leave it blank.” We ended the conversation. In about ten days he sent the answers down. Who has the access now? And who needs it? By entering into a relationship with normal human Americans, and figuring out what really mattered to them and their lives, this newspaper both successfully rebuffed the candidate's attempt to set his own favorable terms and forced him to offer a response to an issue that wasn't part of the scripted campaign pageant. This is how journalists become the "alpha" in their relationship with political candidates -- you identify what they need and when they need it, and then get there first and possess it for yourself. What's stopping you political reporters from doing the same? Nothing, that's what. The only impediment that needs to be surmounted is one of identity correction. Instead of serving as a passive witness to events, you become the prosecutor that precipitates events. Instead of accepting the stakes as defined by a campaign's army of advance staff, you get to set them. And instead of attempting to assay every campaign event according to "optics" -- that view of reality through ersatz eyeballs that you're stuck with when the only voters you've consulted are the imaginary ones that live in your head -- you get to assess the candidates based on real world information that you obtain from real people. This all boils down to a simple question: Who is the dope who's going to end up tangled in a rope? It doesn't have to be the campaign journalists. But until they start using their abilities to actually earn themselves a place on the campaign trail, entangled they shall remain.